Indeed. When you see yourself as a mere speck in the vastness of the bountiful cosmic design, you will recognize and celebrate your nothingness. It is when you think in terms of your narrow vision, focusing only on your turf, your fiefdom__acquired no doubt through education, experience, expertise, hard work, position and business__ do you think of owning, controlling and possessing it. However, in reality, whatever you try to possess is actually possessing you! So, the fear of losing what you possess, cripples you, making you fearful, anxious and unhappy. There’s one way to be free from the clutches of such an existence. That way__and word__is ‘humility’. This morning’s papers reported the story of a respected Judge of the Madras High Court, Justice K.Chandru, retiring from service yesterday. The papers ran pictures of Chandru taking a local suburban train back home. He finished his last day at work as a Judge, came to his office, changed into a dhoti and a khadi shirt, walked__without insisting on being dropped back home in his office car__up to the Beach Station, and boarded a suburban train to his residence on Greenways Road, an upmarket residential neighborhood in Chennai. In India, in Chennai, this is rare. Members of the judiciary are known to fluant their official status on the streets __ riding in cars sporting red beacon lamps! It is also rare for someone relinquishing office not to want, nor allow, a felicitation ceremony to mark his or her tenure. Breaking a century-old tradition, Chandru declined an official farewell. A notice stuck on his office door read: “No deities__no Flowers, no one is hungry__no Fruits, none is shivering__no Shawls. We need only Best Wishes.” Chandru simply finished his work__disposing of 96,000 cases in his less than seven-year tenure__for the day, declared his assets to the Acting Chief Justice (the first time a retired Judge has done so, though the norm requires Judges to do so, nobody really follows it and no one insists either! ), walked out on to the street and blended with the fruitsellers, rickshawpullers, pedestrians and public __ a mere face in the crowd! 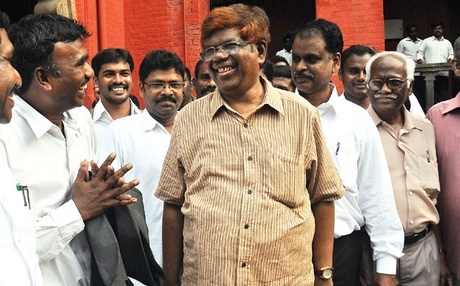 Justice Chandru is humility personified. Important, he doesn’t seem to be doing what he is doing for projecting something he is not. He is who he is! He inspires us to re-think our own lives. How much of the Life you live is led by your ego, even if sub-consciously? How can you make your ego irrelevant by embracing humility, making your Life simpler, happier? Someone says something which you despise – How dare so-and-so say it is ego appearing as anger! Or how unkind and cruel of so-and-so to say it is ego masquerading as a hurt! So, however hard you may try, you can’t get rid of the ego at all. The more you fight your ego, the stronger it will get. Instead, in each of those contexts above, and others, imagine if you did not recognize the ego’s protests at all. What if you did not give it any space, any importance? Wouldn’t it lose its relevance, its power, its control of you, of your emotions? That’s really what just being really means. When you just be, in acceptance of what is, in any situation, with no resistance, no strife, then you are being truly humble. Which is, you are being a true child of creation, of Life, doing your bit and leaving the rest to Life __ no expectations, no wants in return for your effort. When there are no wants, there will be, logically, no unhappiness, right?! It is as simple as it sounds. To be sure, humility does not mean either abstinence or giving up. Humility simply means not wanting, not placing any demands on anyone or anything. Humility also means simply being __ not because you want something in return, but because you love being__and are__that way. Humility is not egolessness. It is not the opposite of being egoistic either. When you are humble, you are being genuine. When you are genuine, you are one with creation. It is this oneness that helps you celebrate who you are and connect with the core of peace and happiness inside you!